The Syringa (Philadelphus lewisii) was designated the state flower of Idaho by the legislature in 1931. It is a branching shrub with clusters of white, fragrant flowers. 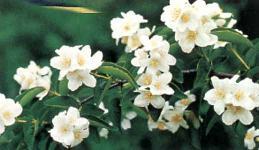 The blossoms are similar to the mock orange, have four petals, and the flowers grow at the ends of short, leafy branches.